Home City Wise Thanks a Lot: What’s The Story With Surface Parking Downtown? In a recent CityLab article, “Parking Has Eaten American Cities,” urban issues guru Richard Florida argues that the country “devotes far too many of its precious resources to parking, [which] is especially troubling given that driving is in decline,” particularly among Millennials. The story is the same in Cincinnati, where surface parking lots mar downtown’s resurgence like missing teeth in a sunny smile. Here are five downtown surface parking lots primed for new life. A sea of asphalt parking lots covers the northwest corner of downtown. Will the arrival of FC Cincinnati’s stadium a few blocks away spur development activity here? The city of Cincinnati sought development proposals for its parking lot across from City Hall, eventually accepting Indianapolis-based Milhaus’s apartment-and-retail plan. Council is also mulling a concept to build new studios here for WVXU and WGUC public radio. 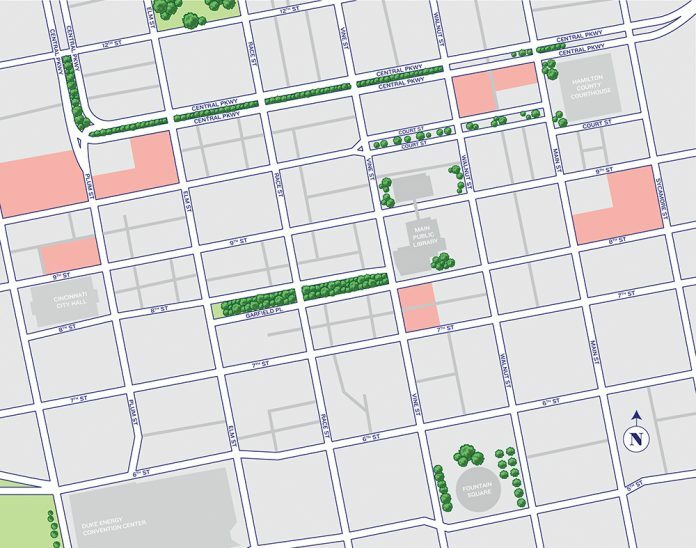 There has long been interest in better connecting Fountain Square and Over-the-Rhine by redeveloping and activating dead spots along Vine Street. This surface lot is the top target. This is how you redevelop a surface lot: downtown’s new grocery store, a residential tower, and a garage to replace all of those depressing parking spaces. The Dennison Hotel’s controversial demolition last year was supposed to clear additional space for a large office development and, in the interim, a small park. Neither has happened yet. Previous articleWhat’s Next For Downtown?